Our travel addi ction began back in the early 1990s. Since then, we have stepped foot on all seven continents and except for a small section of the world between Bangkok, Thailand, and the east African coast, we have circled the world. Along the way, there have been many comfort stops--some more comfortable than others. Perhaps my experiences will be helpful to other female travelers. Male travelers don't seem to need the same kind of accommodations in that area. First of all, all toilets are not created equal. Some of them I wouldn't even call toilets. For instance the "elegant" outhouses we found on one of our tours into the Alaskan wilds. No amount of fake ivy, artificial flowers, and artwork could cover the fact that it was what it was, an outhouse, a one-holer, a hole in the wood with a pit underneath it. Still, I have to give kudos for the air fresheners and toilet paper holder along with the hand sanitizer. It beat the jiffy-johns we endured at the Pasedena Rose Bowl Parade. 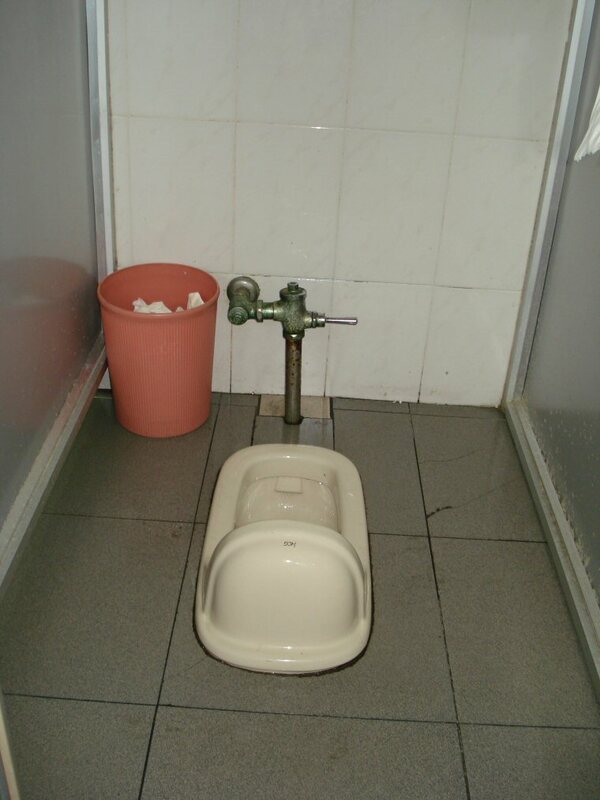 And speaking of attendants, there was the stop in Viet Nam at a Buddhist monastery where the attendant in the "ladies room" was a young monk who was assigned to run into the stall when you were done and pour a bucket of water in the toilet to flush it. I never did see the toilet there. Somehow having a strange male stand outside the door as you relieved yourself was a little more than I could tolerate. 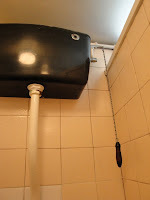 In much of Europe and Australia, the toilets are western-style but not without a bit of a twist. There are various buttons and levers sometimes on the toilet, sometimes in the wall behind it, that give you a choice--full flush or half flush. Decisions, decisions. Another twist on this full/half flush idea was found in one of the B&Bs we stayed in during a trip to England. It had a lever/handle to push. It took a full day to figure out that if you pushed slowly, it only half-flushed but if you pushed it quickly, it full-flushed. England also still has some of the old fashioned toilets with the tank set up high above the toilet and a chain pull for a flush. The first time I pulled one I wasn't sure if I was flushing or turning off the light in the stall. And don't get me started on bidets. We've seen them often in Europe and still don't understand how they work. Although if you want to tackle that, here's a place that tries to explain their use. 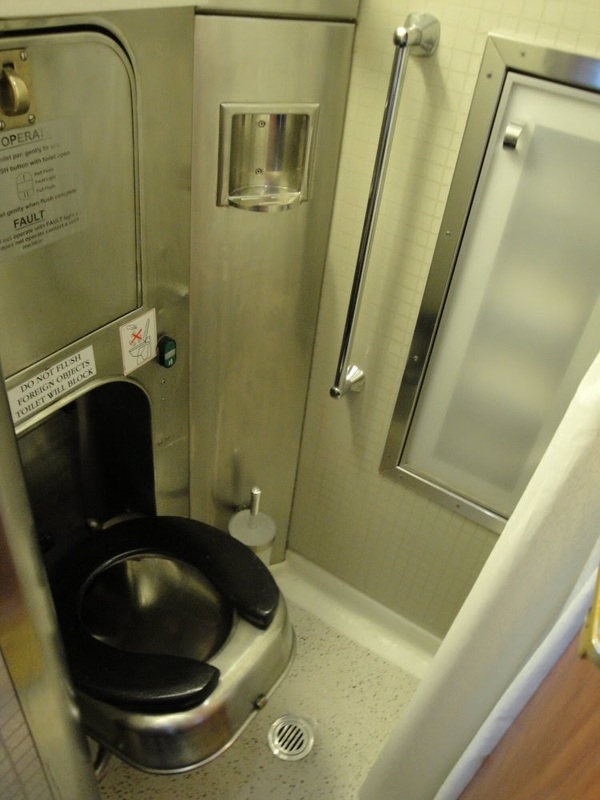 One of the most efficiently designed toilets was on the Ghan Train in Australia. You actually stepped into the shower which was the bathroom and pulled the toilet out of the wall. In order to wash your hands, you pushed the toilet back in and pulled down the sink. Pack them both away and you could shower. The continental USA is not without its peculiar sanitary necessities. In our latest trip through several states we found a couple of toilets with hair triggers. You barely touched the handle and the toilet took over--full flush! Confused yet? I haven't even started to describe the usual facility found on a cruise ship. 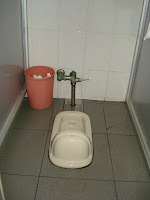 Suffice it to say, with the vaccuum system they use for sanitation, you don't want to flush while you are still sitting.